It was second top versus second bottom in the only Lowland League match to survive the Saturday weather blast, and unfortunately for Dalbeattie Star the result went to form as BSC Glasgow ran out convincing 4-1 winners. It was a depleted Star side that arrived at the Indodrill Stardium with five first team regulars missing. Allan Jenkins, Lee Wells and Liam Park were all suspended. However, the squad was bolstered by the arrival of new signing Calvin Cowie from Edusport Academy and the midfielder had a very promising debut, capped by a quite superb goal. Star went into this match trying to halt a four game losing run, but to do that they would have to produce a major shock against one of the form teams in the league. The first half was pretty much one-way traffic as Star struggled to pose any threat in the BSC half, which meant they were pinned inside theirs for almost all of the opening 45. Indeed inside the first minute they had Scott Milligan to thank when he headed a Ross Smith header off the line from a Declan Hughes corner. The home side were certainly up for it and it was no surprise when they opened the scoring in the 16th minute when Jamie Mills cross from the left found Tom Orr in the centre and the striker had time to take a touch, turn and shoot high past Vinnie Parker in the Star goal. Despite struggling to make any inroads Star continued to work hard and make it difficult for their opponents but two goals in the last ten minutes finished the match as a contest. In the 35th minute Jamie McCormack whipped in a wicked cross from the right which Hugh Cameron had to try and play in the centre with Orr ready to score, but all Scooby could do was chest the ball into the back of his own net and the lead was doubled. Six minutes later and it was 3-0 when Jamie Mills squared the ball to Orr whose effort was blocked but the ball fell nicely to Martin Grehan and he made no mistake from close range. Within seconds of the re-start they scored the goal of the match and gave themselves a huge boost for the second period. A good run down the right from Aiden Kerr saw his cross collected by Milligan at the ede of the six yard box and although the ball was partly cleared it only arrived at the feet of Calvin Cowie some 20 yards from goal and his sweetly struck right foot drive fairly pinged into the bottom corner of the net. 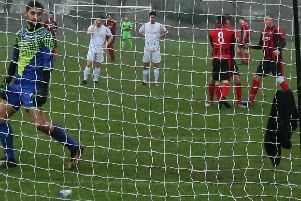 However in the 54th minute the home sides three goal advantage was restored when Martin Grehan’s shot was parried by Parker and Orr was on hand to collect the ball and net the rebound for his second of the match. Come the final whistle the home side were happy with another three points in the bag whilst Star would be encouraged by a positive second half showing when they were staring down the barrel of a thrashing at half-time.